Whats the latest fruit sensation in Australia, it’s the ‘achacha’ a tropical fruit from the rainforests of Bolivia and the botanical name is Garcinia humilis. 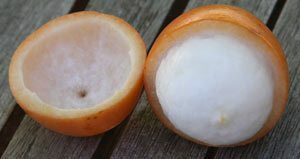 In Bolivia it is called achachairairu and it is related to the Mangosteen (Garcinia mangostana), but looks nothing like one. As for taste, it’s not as sweet as a mangsteen (it actually has a lower sugar content) and tastes a little like a loquat with a hint of passionfruit….. but it is different, we like them with icecream. Orange fruit appear in spring, about the size of a small egg. The white flesh has a bitter/sweet taste. Achacha honey is the most expensive you can find in South America, yes the Achacha is said to has traditional medicinal uses and is prized for these qualities. The orange skin peels away from the white flesh which is eaten, the largish pip is discarded. The flesh can be eaten fresh used to make ice cream, jam or added to fruit punch. The tree itself will reach around 7m depending on conditions and does require a tropical to sub tropical climate. It is really an understory tree from a rainforest. Propagation is from seed or cuttings. 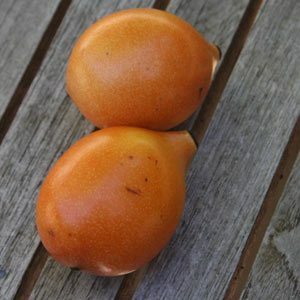 At present Garcinia humilis, Achacha or achachairairu trees or plants are only available for sale in Australia from a few specialist nurseries. Fruit is being produced in Queensland and is available from some of the better fruit stores around the country.